Location: Live in the suburbs and work in the city in a medium-sized town in the South. Childcare Situation: Church daycare full day, 3 days a week ($150/week); stay at home with Dad or Grandma 2 days a week. Up at 7:00; breakfast for everyone, and playtime until 10:00 a.m. or so. I try to start a load of laundry or sneak in some cleaning while playing with my toddler. 10:00 a.m. is snack time, and then toddler and I leave for the grocery store or Target to do the weekly shopping. Around 12:00, Husband, daughter, and I go out to lunch and a bookstore. When we get home, it’s nap time from 1:30–3:30. I do some weekly cleaning and workweek prep and try to read a book or spend time with Husband. When my toddler wakes up, we play outside or inside until 6:30 dinnertime. Husband usually makes dinner, and we eat as a family. Then, bath and bedtime around 7:30. After dinner, Husband and I have some dessert and read, and then I fall asleep on the couch around 9:30 p.m.
Up at 6:30, feed the dog and get coffee started. Wake the toddler up around 7:00 and give her breakfast and make my lunch. Then I get her dressed and myself dressed, and all of a sudden my 7:45 a.m. “need to leave now” alarm is going off. We rush out the door in a mess around 8:10 a.m. I drop her off at daycare and am at work by 9:00. I try to go to the gym for half an hour around 12:00 or 12:30, then eat lunch at my desk before leaving at 5:15. I get home around 6:00. Husband picks up our daughter from daycare around 5:15. If the weather is nice, we take a family walk with the dog; otherwise, playtime until 6:30, when I feed the toddler. After her dinner, read some stories and get ready for bed at 7:30. Meanwhile, Husband is fixing dinner for us. Husband and I eat around 8:00, then talk about our day, watch an hour of Netflix, and I collapse into bed while he stays up to do work. Getting exercise during my lunch break is the only way I’ve found to make time for exercise. It helps me get 4–5 workouts in per week (instead of 2 on the weekends during my daughter’s nap time). I just don’t have it in me to go to the gym before work or after her bedtime. Get up at 6:30 and start coffee and feed the dog. Husband gets up to sneak some work in. Let my toddler sleep until 7:15 because it’s not a daycare day. Give her breakfast when she gets up and make my own lunch. After she finishes breakfast (45 long minutes later), get her dressed and get myself dressed while Husband works. Leave for work around 8:00 a.m. and arrive around 8:45 a.m. Work is either at my desk or court appearances. I go to the gym or take a walk on my lunch break and eat lunch at my desk around 1:00 p.m. I leave work around 5:15 and get home around 6:00. Go out to dinner as a family, then some family playtime, and the toddler goes to bed around 7:30. Husband and I have some alone time, then have dessert and watch an hour or so of TV before I beg off to check personal email, pick out an outfit for tomorrow, etc. In bed at 10:00, and falling asleep on my book at 10:20 p.m. He probably wouldn’t be as happy with work, which would put stress on our relationship. Our daughter likely would be in full-time daycare, which would give me extra guilt, and depending on income, I might try to quit the job I enjoy for part-time work, to be a part-time, stay-at-home mom. It would also take a lot more juggling for her doctors appointments, who stays home when she’s sick or daycare is closed, etc. This is to say, it would be different, and I don’t think it would be for the better! Get up between 6:30 and 6:45 and feed the dog and start coffee. Get my toddler up before 7:00, because it’s a daycare day. Eat breakfast with my toddler while Husband sleeps in. Decide to buy lunch out today to spend a few more minutes of quality time with my daughter. Get us both dressed and we’re out the door around 8:15 a.m. Drop her off at daycare and get to work around 9:00 a.m. Work until I take a full hour lunch at 1:00 and relish reading a book without interruption. Back to work until 5:15, and then drive home in traffic to arrive around 6:00 p.m. We take a family walk around the neighborhood and then I feed our toddler around 6:30. Family playtime until 7:30, then bath and bedtime for her. Husband fixes dinner for us while I give her a bath, and we eat around 8:00 p.m. Dinner conversation stretches until 9:00 p.m. or so, when we settle onto the couch and read until I fall asleep on my book at 9:30 p.m. I head up to bed while Husband continues to read until 11:00 p.m. or so. I believe it has changed the way I look at my career, and that’s to see my career as more than a job but only one aspect of my life. I want to show my daughter what it means to have fulfilling work that is more than a means of income. 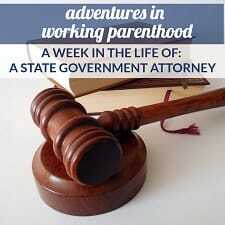 However, as much as I enjoy being a lawyer, I don’t have ambitions of being partner or running the office, because being a staff-level attorney means I have a pretty regular 40-hour-a-week schedule [with] nights, weekends, and plenty of paid holidays and vacation time to spend with my family. It’s no longer about making partner in seven years and a six-figure income, but doing a job I enjoy that allows me to be a happy wife and mom, too. Get up at 6:45 and feed the dog and start coffee. Daughter wakes up at 7:00, ready to go. Husband gets up to do some work. Make my daughter and I breakfast and make my lunch while she’s finishing. Read a book with her before herding her upstairs to get dressed (I know it will make me late, but I can’t resist when she asks to read with me.) Get myself dressed and pick out an outfit for her, but can’t get her to slow down and actually get dressed. Throw up my hands and deliver her to my Husband in pajamas. Leave the house, disheveled, at 8:15 and get to work at 9:00 a.m. Husband takes our daughter to his parents’ house (20 minutes away) so he can go to meetings. I work at my desk or have court until 12:30, eat half of lunch at my desk, then go to the gym for half an hour at 1:00 p.m. Eat the other half of my lunch when I get back to my desk and work until 5:00. I leave at 5:15 and get home around 6:00 p.m. Husband has just gotten home with our toddler when I get home. We take a family walk, then I feed her dinner while he finishes up work for the day. After her dinner, we read some stories, and I chase her around until she consents to put on pajamas and go to bed, around 7:45 p.m. Husband makes us dinner, and we eat around 8:15. After dinner, we watch some Netflix and I head to bed around 9:45 p.m.
Get up at 6:30, start coffee, and feed the dog. Wake the toddler up at 7:00, and we eat breakfast together. I make my lunch while encouraging her to finish breakfast because, as usual, we’re running late. Get her dressed and get myself dressed and then we’re out the door at 8:10 (late, but earlier than usual! Yes!). Drop her off at daycare and then get to work around 9:15. Work until 12:45, then take a short lunch break because I was so late this morning. After lunch, work at my desk until 5:15. Traffic is light, so I’m home at 5:45. Husband and I agree that, after a long week, dinner out is necessary. Head out to one of our staple family-friendly-restaurants-that-also-happens-to-have-decent-food around 6:00. Back home and ready for stories and bath time around 7:00 p.m. Daughter is in bed around 7:30 p.m., and we binge watch Netflix until 10:00, when I go to bed and Husband stays up to read. Sleep in until 7:00 a.m.! Feed the dog, start coffee, and make French toast, bacon, and fruit for a big family breakfast. Wake the toddler and Husband up around 7:15 and 7:45, respectively, for breakfast. After breakfast, Husband goes to the gym and my daughter and I go to the weekly library story time at 9:30. After the library, we have a snack at Starbucks, then come home and have lunch together around 12:00 p.m. Husband, daughter, dog, and I play outside until nap time at 1:30. While she’s napping, I make the weekly grocery list and do some cleaning. When she wakes up, around 3:30, she and I go to the grocery store; she loves to help me shop. When we get home, Husband entertains her while I unload the groceries and straighten up the house. I feed our daughter dinner around 6:30 p.m., and then Husband and I play with her until she goes to bed at 7:30. After she goes to bed, we guiltily order a pizza and watch Netflix until I fall asleep on the couch at 9:30 p.m. Husband stays up to read until 11:00 or so. Thanks so much to Emily S. for sharing a bit of her life as a working mom! 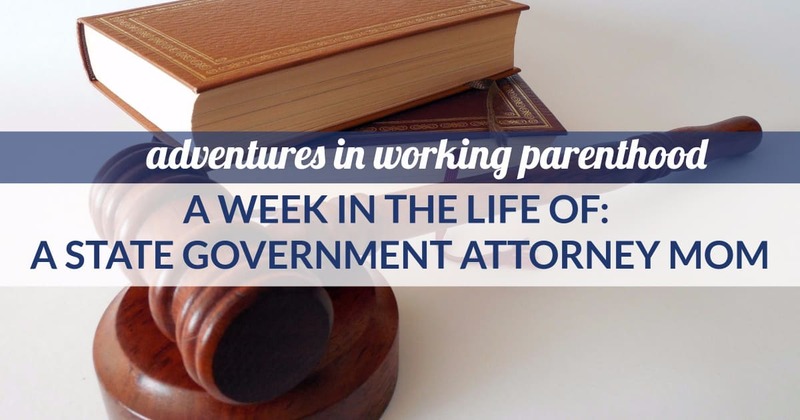 Readers, what’s your biggest takeaway from her week of work as an state government attorney, as well as her general work/life balance? I’m really impressed by how you prioritize exercise. I like the family walk idea so much, but my kids are STARVING when they get home and can’t make it until 630 until dinner. Do you mind sharing your daughter’s eating schedule? Does she get two snacks in the afternoon? Or just a late snack? Childcare cost-envy… in the northeast its 3x this cost. Part time doesn’t seem to really abate the cost (4 days costs the same as 5 generally, and part time is 75% the cost of full time. Not Emily, but my kids do fine with a later dinner, around 6:30/6:45 during the week. I think it helps that we have kept this schedule since they have gotten on solids. They generally eat 2-3 times between breakfast and dinner, none of which are necessarily “lunch” or at lunchtime. They usually eat when someone complains about being hungry or before/after nap. The late dinner is to prioritize family dinner. We usually eat right after I get home from work. My coworker stretched her kids until a later dinner by telling them they could eat their vegetables first. If dinner included green beans, they could have their green beans. If it was frozen peas, they could have their peas. She said it was a great way to get the kids to eat vegetables (since that was all that was out) and bought another hour. I’m always interested in the parents who eat separate dinners from their toddlers. I really haven’t figured out what to feed my toddler that isn’t what we eat. Will other people share what your toddlers eat for dinner if it isn’t what you and/or your partner eat? I am imagining that the kids’ meals are faster to prepare than the parents’ meals? In general, our eat-as-a-family routine works really well. But it would be nice on some hectic days or when Husband and I want an at-home date night. I recommend either (a) leftovers or (b) something simple like grilled cheese or PBJ. Our toddler is young (13 mo) and just starting to really eat dinner, but it’s way too early for us at around 5:30 or 6. We plan to make enough food for leftovers whenever possible when cooking, so she often gets that. Last night she had grilled cheese and leftover squash. I sat with her and ate some other leftover veggie dish from the night before so we had the communal experience but left room for me to enjoy dinner later once my husband came home. Seems to work well even though we’re just a few weeks into this toddler dinner thing! We currently do this. We usually have a set of 3-5 options for dinner in any given week. Some of those are pre-made over the weekend, some of those are easy to make as soon as we walk in the door, and some of those are frozen. It has it’s pros and its cons. The pros are that it’s really fast to get food on the table and the adults can eat at a time that better suits them. The con is that there’s not a lot of variety, and it’s hard to get in new foods so we have to reserve that for weekends. If we make something that has leftovers, we’ll also give her leftovers. The regular entrée staples for my kid are: chickpeas + mixed vegetables in a tikka masala sauce; black beans (no rice, just the beans); pasta; Amy’s frozen macaroni and cheese; Dr. Prager’s fishies with ketchup, PB &J; scrambled eggs. I’d love to say we supplement w/ vegetables but the reality is he doesn’t eat them. But I serve him veggies along side those meat and fish options. Also if I’m short on time: peanut butter and jelly is dinner. He doesn’t get it during the week at school so I give it to him for dinner sometimes. My son gets leftovers of whatever I made myself the night before. If there aren’t leftovers, it’s usually PB&J or mac and cheese with frozen veggies, but I try to minimize that. My daughter eats around 530/6 at latest and I almost never get home before 545/6 so eating together would be impossible on weekdays. We make a batch of “weekday food” for her early in the week. It’s usually the same thing week to week but she doesn’t seem to mind. Usually, we do some kind of soup and chicken or turkey meatballs and veggies. She’ll have one for lunch and the other for dinner and it takes no time to reheat. Breakfast is typically oatmeal but that takes no time to cook in the AM. For weekends or nights when we don’t have ready food for her, we’ll usually do scrambled eggs and some kind of quick veggie like sautéed zucchini for dinner. It’s all really very automated so isn’t hard to do. We eat dinner together most nights between 7:30 and 8:30 (NYC) and my son is definitely hungry before that, so I let him eat a snack on the way home that isn’t too filling (i.e. dried seaweed, carrots, grapes, almonds.) In terms of quick week night dinners, I’ve discovered lately that pork loin is really fast- brown it in the pan for a few minutes on each side and then bake it uncovered at 400 for about 20 min. Just a few more ideas. When I have odds and ends leftovers, I throw them in a freezer Ziploc or container and then have a supply of easily microwavable toddler meal portions. My kiddo also really loves baked beans, which are kind of a treat but have become a great thing to keep around when I don’t have bright ideas for her dinner. 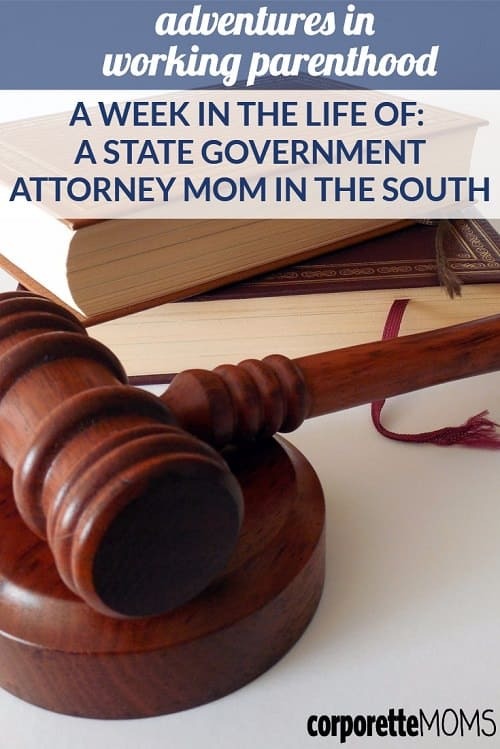 I am also a government attorney in a SEUS city with a work-from-home husband and a toddler (15 months). I really like your perspective that “It’s no longer about making partner in seven years and a six-figure income, but doing a job I enjoy that allows me to be a happy wife and mom, too.” I share this same perspective, but sometimes, the Very Ambitious Me thinks I “should” be wanting more out of my carrer. Especially the cash! Thanks for sharing. Like I always say, I really enjoy reading this series. Yeah my kids are older than hers and this quote struck me as very self-aware, a very healthy perspective on balance – I wish I had that clarity sooner. In truth, I still don’t have it because as you said, the Content Me wars with the Very Ambitious Me about what I “should” be wanting from my life. I’d love to hear more about the 30 minute workouts that you do at lunch. I also struggle going to the gym before work or after my kids are in bed, but can’t figure out how to get in a decent 30 minute workout at lunch when you factor in the time it takes to change clothes and shower (or figure out a workout that doesn’t make me sweaty and gross – does this unicorn exist?). What about a strength training workout through Fitness Blender? I love this one, it works you hard but you’re not jumping around breaking a huge sweat. Thanks for sharing your routine and major kudos to you for getting 8+ hours of sleep at night! I also have a similar sleep situation with DH where I go to bed much earlier than him as he has a flex schedule and can sleep in in the mornings. SUPER impressed with the gym-at-midday thing! What kind of exercise do you do? Do you take a shower after? How do you make sure you don’t smell/look unkempt? On the food thing…we eat together as a family around 6pm. It has taken me ages to figure this out, since my darling husband refuses to eat frozen or canned food or eat microwaved food…aaargh, how did I only find that out after we were married?! We typically have slow cooker meals, or other simple meals like spaghetti Bolognese, rice and veggies from the rice cooker/steamer combo machine, or soup (which is surprisingly fast and simple to make…honestly!). On days when we don’t have time/energy to cook (or we forgot to set the slow cooker), we have sandwiches (usually tomato and melted cheese in a flour tortilla, heated up on a frying pan…it’s really good!). We all eat together, which I love because we get a connection (we both work full time and have 2 little ones) and I get to monitor how much and what exactly the children are eating. It also allows me to be focused on the children’s behavior and moods, teach good table manners and behavior (the kids’ behavior of course! ), and we consider it quality time, if that isn’t too cheesy. Then one of us will take the children for their bedtime routine, while the other clears the table and loads/runs the dishwasher. I second the questions about exercise. I have been thinking about going to the gym in our office mid-day but it feels like a bit of a chore. Part of the problem is that I’m still pumping (during my lunch) so it’s hard to make even more time for myself….maybe in a few months when I stop pumping.